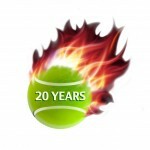 The countdown to the much anticipated Dubai Duty Free Tennis Championships has begun and will culminate at the Dubai Tennis Stadium, Garhoud on Monday 20th February, 2012. Preparations for the 20th anniversary are in full flow as Dubai gets set to once again welcome 8 of the world’s top ten women’s players and 6 of the top ten men’s players to centre court where they will vie for the title and a share of the USD$4 million total prize purse. Held under the patronage of H.H. Sheikh Mohammed bin Rashid Al Maktoum, Vice-President and Prime Minister of the UAE and Ruler of Dubai, the Dubai Duty Free Tennis Championships remains a firm favourite amongst the top ranked female players on the WTA’s Premier-Event calendar and furthermore holds the accolade of the Middle East’s only ATP 500 tournament. The 2012 line-up of stars is shaping up to be as strong as previous years, and one where some of the world’s best will take on the up and coming stars, all of whom are focused on claiming both valuable ranking points. Fans can expect to enjoy special 20th anniversary celebrations as the championships will look back on past stars achievements as well as exciting action on the court with extra seating on Court One for ticket holders to catch the extra games. Dubai Duty Free will continue to run the increasingly popular Ladies’ Day activities, special children tennis clinics, as well as a variety of family-fun and entertainment over the 2-week event. The 2012 Championships will follow previous years’ formats with the WTA tournament being run from February 20th and 26th, followed by the ATP tournament from February 27th to 3rd March. Click here for the tournament schedule. Tickets are now on sale, and based on previous years, are highly likely to sell out fast. For ticking info click here. Click here for further info about the venue and how to get there.